Taylor and I were hanging out on Sunday wrestling for control of the remote control – I was interested in watching the Pats destroy the Chargers, he in Chris Matthews – when on came the 60 Minutes Interview with Alan Greenspan. It was all very interesting until boom – the 10th minute of this clip reminded us why Jon Stewart’s job is so easy. 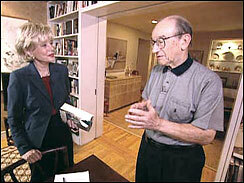 In the interview Leslie Stahl berates Greenspan for a speech he gave in March where he publicly suggested there was a one in three chance the US economy could go into recession. Although Greenspan – then retired from his role as Federal Reserve Chairman – gave the speech as both a private citizen and business owner soliciting clients, Stahl suggests that Greenspan’s critics were correct in asserting he should keep his mouth shut since his voice is influential. So let me get this right. Greenspan is so smart, so reliable, and so trusted on economic matters, that we shouldn’t let him speak about the economy. You know, just in case he may have bad news to deliver. And this from 60 minutes! Yes, the press is giving Greenspan a hard time for not sufficiently self-censoring himself. Needless to say, we went back to watching the ball game. The past 7 years have been for censorship, and in particular self-censorship, particularly in the US. From discussions about weapons of mass destruction in the Oval Office, to the presses efforts to talk about the Iraq war, to transparency in the US economy, censorship is on the march… sponsored, apparently, by your national news broadcaster. This entry was posted in free culture, random and tagged 60 Minutes, Alan Greenspan, free culture, Jon Stewart, Leslie Stahl, media, random, self-censorship on September 17, 2007 by David Eaves. I tried to post a comment earlier today but it didn’t seem to work. Trying it again.